I've been making a lot of changes to my website, so if you're looking for some of my older games I have them on this page. Scroll down to see them. 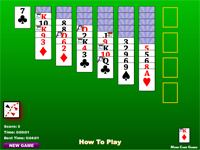 On our site we have several great games including Spades, Hearts, Euchre, Solitaire, Golf Solitaire, BlackJack, War, and a variety of Poker Games. If you're at work, take a short break and play for 10 minutes. If you're not at work you can play our card games for hours. Hit, Split, or Double Down. The goal is to get as close to 21 as you can with out going over. Beat the dealer for a payout. Hearts is a trick taking card game played with four players, no teams, and no trump suit. It is in the Reverse familiy of card games, meaning that the object of the game is to avoid taking points. Euchre is a trick taking card game played with two teams, and a deck with all cards below 9 removed. Trump in Euchre changes each round. 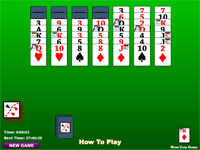 Yukon Solitaire is a solitaire game similar to Classic Solitaire except all the cards in the deck are dealt into seven columns. Spades is a trick taking card game played with two sets of partners. 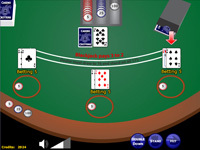 At the beginning of each round the players declare the number of tricks they believe they can take. Look for a minimum of a pair of face cards. Credits are awarded based on the pay table at the top of the screen. 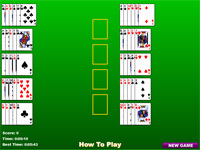 Spiderette Solitaire is a solitaire card game similar to Spider Solitaire, but played with a single deck of cards, instead of two decks. 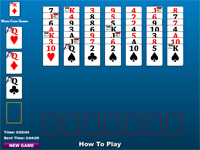 The game is played without foundations so the player must attempt to properly arrange his cards within the 7 columns of the game. 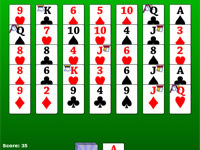 Penguin Solitaire is a solitaire card game similar to Freecell, in which the player is given 7 reserve cells to place cards as he sorts the 7 columns of the game into the 4 foundations, in order and by suit. 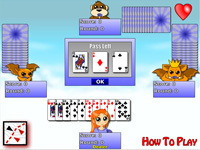 Bristol Solitaire is a solitaire card game where the cards must be arranged into four foundations in order and by suit. 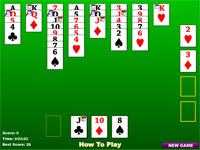 Scorpion Solitaire is a solitaire card game where the cards played without foundations. 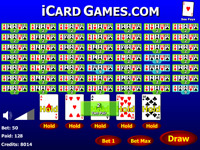 The object of the game is to arrange the cards from King to Ace and by suit into 4 columns. 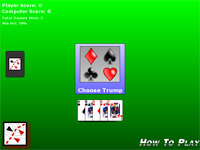 Euchre Solitaire is a single player version of the card game Euchre where the player takes tricks agains the deck and wins if he can take 3 tricks out of 5. Solitaire Tower is a solitaire game in which the player attemts to move all the cards from a pyramid of cards to the foundation below by moving the lowest row of cards if it's value is one greater than or one less than the value of the current card in the foundation. 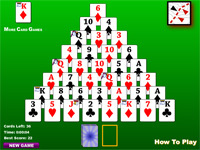 Fortress Solitaire is a solitaire card game where all 52 cards are dealt face up into 10 rows. Only the top card in each row may be moved between rows or to the foundation. Cards can be moved between rows if their value is one greater than or one less than the top card in that row. 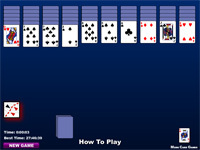 Spider Solitaire is a two deck solitaire game played without foundations. 54 cards are dealt into 10 columns. The player can move cards between the columns regardless of suit. 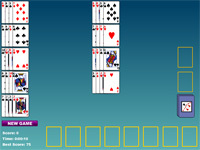 Solitaire Golf is a solitaire game in which the player attemts to move all the cards from seven columns of cards to the foundation below by moving the lowest card in the column if it's value is one greater than or one less than the value of the current card in the foundation. 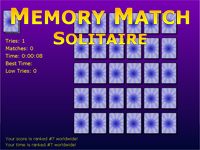 Memory Match Solitaire is a card game played with a 52 card deck where 30 cards are dealt on rows and columns, and the player flips over cards until he has matched all the card values from the deck. 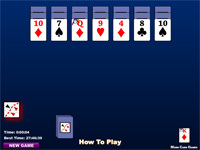 Maria Solitaire is a 2 deck solitaire card game where 36 of the cards are dealt into 9 piles.